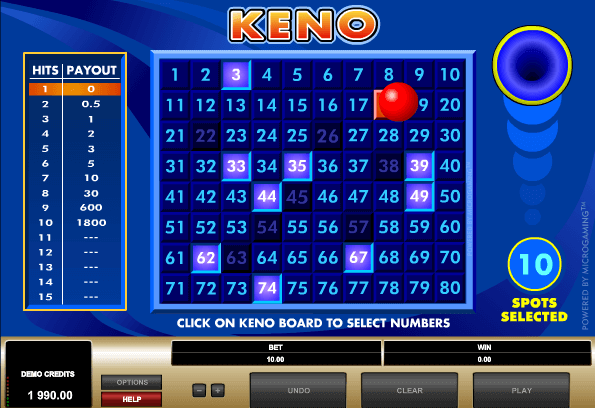 Keno is a lottery style casino game where 20 numbers are drawn out of a pool of 80 numbers. Players place bets by selecting anywhere from 1 to 20 numbers depending on the game, with the maximum number of selections typically ranging from 1 to 15, depending on the chosen format of the Keno operator. So this is a very simple game to play actually and requires no skill whatsoever on the part of the player, apart from knowing how to fill out a bet ticket, marking off their chosen numbers, whether this be on a physical ticket with a land based Keno game, or on a virtual ticket with online Keno. If you are a bit more advanced and wish to increase your winning odds, you can and should check for the return a certain Keno game offers. (You can also check our list of best online keno games by return). With land based Keno, draws are conducted at appointed times, usually at regular intervals throughout the day, and players either visit the Keno lounge on hand to place their bets, or may be able to do so through Keno runners, casino staff that travel to various places in the casino to collect Keno bets. Players who hold winning tickets at land based Keno games have to check their tickets and visit the cashier to redeem their winnings. This is certainly the best part of playing and people certainly don’t mind stepping up to the wicket and collecting some cash. Online Keno does make things even simpler, as there is never any waiting for draws. You also get your winnings credited to your account automatically and instantly, which can be seen as another benefit. There is something that might be said about having to wait for Keno draws, like you do at land based casino Keno games, as some people may enjoy the wait, and this also serves as a barrier to them playing too much perhaps. While instant Keno does provide immediate gratification, one of the things that makes Keno stand out is that there is indeed a wait for it, at least with the traditional version, and with that barrier removed, then one may find themselves playing too much like one may play other casino games too much. However that’s because the game is so much fun, and in the end, if you can pack more fun into your Keno playing, that’s generally a good thing. Casino players do tend to prefer faster results and that’s why slots are king. So overall, instant Keno is seen as a plus by players, especially since for many players, they can’t play traditional Keno anyway due to lack of access other than online. More lotteries are getting into offering Keno these days, and some offer a hybrid version, where games are scheduled at regular intervals and players choose their numbers at electronic terminals operated by the lottery. Regardless of the format, players first decide how much they want to bet on the ticket, and depending on the casino or online casino the minimum and maximum bets will differ. It will be made clear to you what the range is here and you simply choose a bet within this range that you prefer. Of course online, you can play free keno, but that’s not much fun and can be seen as a way to learn the game. Some people claim that betting smaller is preferable if that leads you to being able to play more often, and it is true that the more games you play, the better your chance to hit bigger prizes, but these bigger prizes will be smaller due to the smaller bet size. However, if betting smaller allows you to play more, then there’s certainly something to be said about that, because this may lead to you getting more enjoyment out of the game. Some players may prefer to go bigger and play less often though, so this is a personal preference really. Once the bet is placed, players choose how many numbers they wish to bet on, generally from 1 to 10. Some think that choosing numbers in the middle of this range, as in 4 to 6, is better, but this is going to depend on the pay tables, the effective odds for each number of selections, and this does differ by casino or online casino, so this all depends. Then, you select which numbers from among the 80 possible ones that you wish to play, then wait for the drawing. 20 out of the 80 numbers are then drawn, and depending on how many of your numbers match these 20, you can win various amounts of money, or lose your bet if you are not successful. Since the numbers drawn are always selected at random in Keno, there is no way to come up with a scheme to beat the game over time, although some players who don’t understand this think that past results matter. This is called the gambler’s fallacy, and it’s pretty harmless for the most part, but it’s better to understand that past results in no way influence future results, by design actually. With online Keno, one can enjoy watching the draw be animated, where the computer takes its time populating the selected numbers to make playing more enjoyable, adding a bit of anticipation in other words. This makes it more like a Keno game with balls drawn, at a live Keno lounge, although using balls is certainly old fashioned these days. Keno is a lot of fun to play though and now that we can play it anytime we want, more and more players are getting turned on to it.